Today K was introduced to 'The Village'. I realise it has taken me awhile since I first told you about Arithmetic Village. The little wooden treasure box pictured above, is the reason why. I knew I could get them as I have seen them many times before, but do you think I could find one when I needed one, no! Finally on my recent visit to my local art and craft supply store they had them in stock (now I'm kinda thinking maybe I should've bought a few). I knew having a 'real' looking treasure chest would add to the magic of Arithmetic Village and I wasn't settling for anything else. I wasn't wrong! The first book in the series is a simple, rythmical introduction to the Village and its' characters. I knew that it would only take a very brief moment to read the story to K and I wanted to draw out the magic for as long as I could. I filled 9 (nine) jewel sacks with 10 jewels in each and placed them inside the unpainted chest. I placed that next to me on my left, hidden under a towel. Next to the chest (but also hidden under the towel) I placed 1 (one) empty jewel sack and 10 (ten) jewels. Choosing the perfect time of the day, where K and I could be alone for a few minutes was a challenge, but I was able to sneek it in when the boys were off busy doing whatever it is that boys do. We sat together on the floor, her on my right, the hidden treasures on my left and the book in front of us. Together we turned to the first page and as I began reading blue jewels started falling from the sky onto the book. K loves blue and loves all things sparkly and I knew she would enjoy these. We continued to read, K held and played with the jewels and was enthralled with the gorgeous illustrations on the pages in front of her. When it came time for the jewel sacks to appear I placed the empty one I had to my left on the page. Together we counted the jewels that had fallen from the sky, just to see how many there were and to our surprise there were 10 (ten), the exact number required to fill a sack, fancy that! She loved that and was eager to continue on and was so taken with the book that she had no idea I had more surprises waiting for her right by my side. You see the villagers can't possibly carry an infinte number of sacks filled with jewels and to help them out they use treasure boxes that perfectly hold 10 (ten) sacks each filled with 10 (ten) jewels. I slowly turned the page and at the same time the treasure chest emerged and I placed it on the page as I read. K's face was sheer delight, absolute magic, this is hands down, the BEST EVER moment I have experienced in our nearly 4 years of homeschooling....it literally took my breath away. I was so excited to be experiencing this with her and to be the one to show it to her, that will be one special moment that stays with us for a long time to come. Her eyes lit up, her face glowed and her smile went from ear to ear....all that waiting for that one little treasure box was oh so worth it! She placed her sack of jewels in the chest and together we counted how many sacks the treasure chest held in total. We finished the story, she couldn't stop caressing her little treasure chest and asking me, "Did you get this just for me mum? ", "What about B and C, is it just for me?" To have something like this that was purely hers...I wish I could have read her mind. Then I told her she could decorate it in anyway she wanted. You might have noticed in the page from the book that the chest was described as 'sparkly and gold'. Here I was thinking that we would end up with a very brightly coloured chest, but no, she was adamant that it had to be gold. I suggested that we remove the hinges to make painting easier, but I don't think she believed that I would be able to get them back on, so instead we placed some sticky tape over the top of them. She spent quite some time painting and decided that glitter glue would make up the 'sparkly' component and set to it with her supply of glitter glue pens. I did lend a little hand with her diamonds as she was getting a little frustrated with them but otherwise the finished treasure chest is completely K's handiwork. It's outside drying as I type. Even though K has some understanding of Place Value and Numbers, we will spend some time enjoying getting to know the village and its' villagers (exploring place value and building numbers) before we move on to the next book in the series. 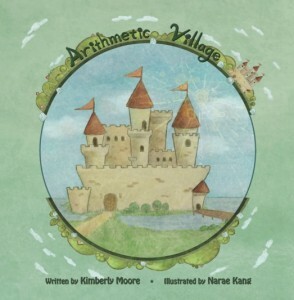 Disclosure: I was given a copy of Arithmetic Village for the purpose of reviewing. All opinions on this blog are my own and were not in anyway influenced by the product provided or by the company. It was such a pleasure to join you on that journey of introduction. I have seen this myself at my workshops, but since the books are newly distributed, this was the very first time I watched from afar. Absolutely beautiful, thanks so much Kylie! This little 'village' looks great! Your daughter certainly seems very taken with it! This was a lovely review. I think I might like the series for my own children. Kylie, this sounds wonderful! I've been looking and looking at this set of books and wondering ... and now I think we may just have to give them a try after reading this review.